Home » Libera, or the female Bacchus in a tunic of fine material. A statue of Liberia, or the female Bacchus, crowned with a wreath of ivy. The hair is parted along the top of the head, and is gathered into a large knot behind; at each side descend two ringlets very formally adjusted, and at the top a small portion is tied into a bow. A wreath of ivy leaves and berries encircles the head. She is clothed in a tunic of fine material, furnished with ample sleeves fastened along the arm above the elbow with small buttons; it descends quite to the ground, a small portion appearing upon the right foot. Over this is a peplus of stronger texture, doubled at the shoulders where it is fastened; the under portion descends to the feet, the upper a little below the waist. The edges down the right side are left disunited and hang slightly separated, the corners of the shorter portion being kept down by small bulbs of lead or bronze. A belt, passing over the right shoulder and round the left side of the waist, supports this garment, and gives a graceful variety to its folds. 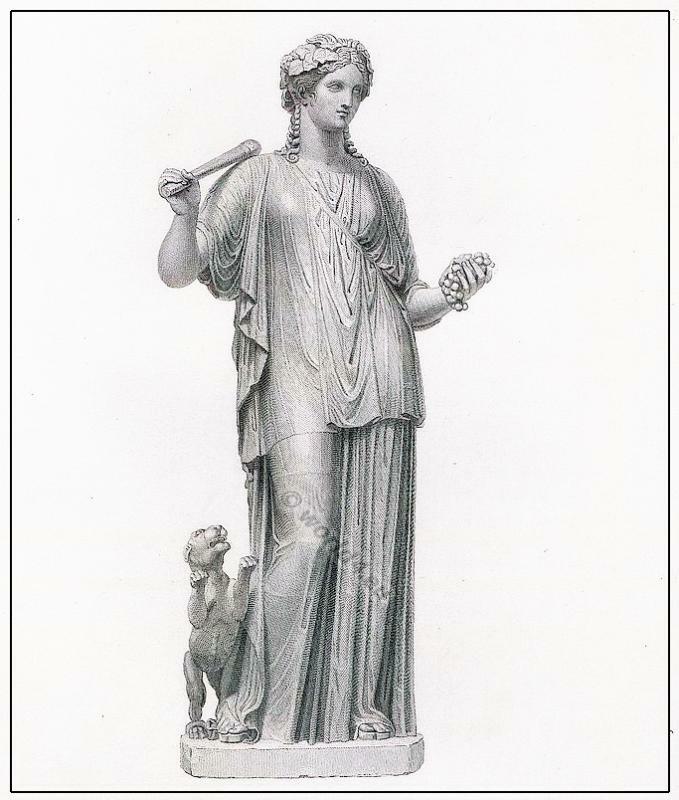 In her left hand the goddess carries a bunch of grapes, and with her right supports a staff, which rests upon her shoulder. At her right foot is a panther playfully raising himself towards her upon his hind legs. She wears sandals with very thick soles, at the sides of which are strong clasps and open loops, the straps by which they were to be attached to the foot being purposely omitted. The beautiful simplicity with which the draperies are arranged, render this one of the most graceful and pleasing statues in the gallery. The calmness and dignified repose of the form, as well as the beauty of the countenance, might justify the conclusion that it was intended to represent Ariadne, rather than any other of the family or suite of Bacchus, who are more frequently represented with frantic gestures or, at least, displaying an exuberance of action, and engaged in Bacchic orgies. This statue has undergone some restoration, the nose and both arms being partially modern; the staff over the shoulder was probably a thyrsus. This statue was found by Mr. Gavin Hamilton, in the year 1776 at Roma Vecchia, a few miles from Rome, on the road to Frascati. It was purchased by the Hon. Charles Greville from whose collection it passed to that of Mr. Towneley. Liber and Libera is a pair of ancient Roman gods, which took over the Greek cult of Dionysus and Kore. The Feast of Liberalia was at 17. March celebrated. The orgiastic bacchanalia were banned in Rome again or be curtailed in their often boundless excesses, but without resounding success. This entry was posted in Ancient, Hairstyle, Roman and tagged Ancient Roman Costumes, Ancient sculpture on 8/16/13 by world4.